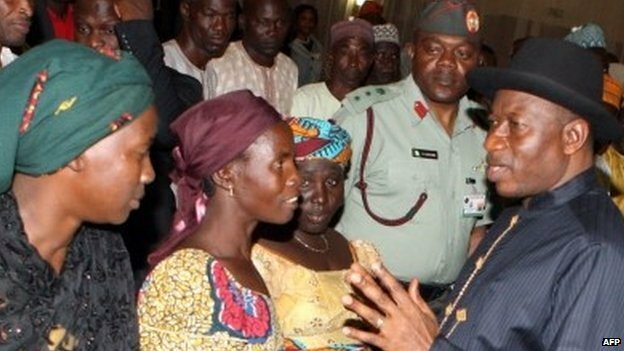 President Goodluck Jonathan on Tuesday met with parents of the girls abducted from the Government Secondary School, Chibok, Borno State, on April 14 by Boko Haram insurgents. Journalists were barred from the meeting which took place inside the Banquet Room of the Presidential Villa, Abuja, exactly 99 days after the girls were forcibly taken away from their school hostel at night . But our correspondent gathered from a source at the meeting that some of the 51 girls, who escaped from their captors wept as they narrated their ordeal to Jonathan. He said that the girls appealed to the President to expedite action and ensure that their colleagues who are still in captivity are rescued on time. The source added, “The girls narrated how they jumped out of moving vehicles on the night of their abduction. “They said they ran into the bush without any knowledge of where they were and where they were heading for. “The girls said they trekked cautiously inside the thick bush up until daybreak before they saw some Fulani men who offered to assist them because they were still in their school uniforms. Our source added that four other girls also told the President that they escaped when they went to fetch water from a stream. According to him, the girls who said they were five as of the time of their escape, regretted that they could not locate one of them who fled in another direction. He said, “They told the President that they managed to escape when they went to fetch water from a stream. He added that many at the meeting, especially women, shed tears when the girls started pleading with the President to do everything within his powers to ensure that their colleagues were rescued. The meeting was also attended by the President of the Senate, David Mark ; Borno State Governor Kashim Shettima; his Bauchi State counterpart, Isa Yuguda; some members of the Federal Executive Council, security chiefs, the principal of the GSS, opinion and community leaders from Chibok. 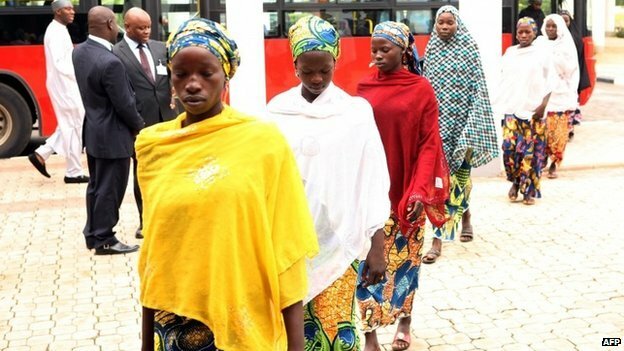 The 51 escaped girls, their parents and others were conveyed to and fro the venue of the meeting in four red luxury buses belonging to the Abuja Urban Mass Transport Company Limited amid tight security provided by a combined team of men of the Department of State Service and policemen. The security operatives shielded them from journalists before and after the meeting that lasted about three hours. The venue wore a sombre look with the escaped girls who looked traumatised being the cynosure of all eyes. The meeting started with the arrival of Jonathan, who was joined by Mark, Shettima, Yuguda, some FEC members and the security chiefs . Immediately the meeting commenced at about 11:20am, journalists were asked to leave the venue. The doors of the Baquet Room were only re-opened to journalists shortly after the President had made his closing remarks. Photojournalists were however able to capture him in a group photograph with the escaped girls. The Special Adviser to the President on Media and Publicity, Dr. Reuben Abati, told State House correspondents after the meeting that his boss had the opportunity to listen first-hand to the various categories of persons. Abati described the meeting as a good development because Jonathan had always been looking forward to such an opportunity, having met with other stakeholders on the matter before. “Statements were made by all the representatives. They spoke their minds and conveyed their feelings to the President. “The girls who escaped also gave an account of what they went through. Mr. President reassured them of the Federal Government’s determination and his own personal determination to ensure that the girls that are still in captivity are brought out alive. “That is the main objective of the government. Mr. President also used the opportunity to reassure the parents and the girls that everything will be done to make things easier for them, especially those who have escaped and the ones that will also be rescued. He promised them that their education will not in anyway suffer and he is convinced that evil will never prevail over good. “Mr. President further assured them that after the battle has been won and the girls are brought back home, he, together with the parents and the (Borno) state government will focus on development, on building Chibok, on building all that the terrorists had destroyed and on ensuring that every child, either in Chibok or in any other part of the country, has his/her dream realised. He added that Jonathan told the gathering that efforts were being made to place the escaped girls in other schools. On media reports that most of the real parents of the abducted girls were not part of the meeting, Abati said the parents who attended made it clear that they were representatives of other parents. He said over 200 people from Chibok attended the meeting. “The girls spoke in great details about their experiences and their observations. It was an open and frank session in which everybody expressed their minds,” he concluded. Abati later issued a statement in which he said that Jonathan’s desire was to visit Chibok after the abducted girls might have been rescued. According to Abati, the President believes that it is only then that the parents of the girls could receive him with smiling faces rather than with tears. He said that the President told the gathering that his heart was constantly with the parents, despite the fact that he had not visited their town. “Our duty now is to take all relevant steps to recover our girls alive and our primary interest is getting them out as safely as possible. I will not want to say much, but we are doing everything humanly possible to get the girls out. “This is not the time for talking much. This is the time for action. We will get to the time that we will tell stories. We will get to the time that we will celebrate and I assure you that, by God’s grace, that time will come soon. “Anyone who gives you the impression that we are aloof and that we are not doing what we are supposed to do to get the girls out is not being truthful. The President was quoted as saying that the National Emergency Management Agency and federal medical agencies would intensify their efforts to provide the people of Chibok and their neighbours with additional relief aid and assistance. He also assured them that Chibok and other communities in the three North-East states most affected by the Boko Haram insurgency would be the first beneficiaries of the Victims’ Support Fund, a Presidential Initiative for the North-East. The VSF and the Safe Schools Initiative are some of the developmental programmes which the Federal Government put in place to address the damage, losses, setbacks, economic and social dislocations occasioned by the Boko Haram insurgency. Abati also quoted the Borno State governor as calling for more sobriety, reflection and unity of purpose in the fight against terrorism in the country. He pledged that his state would give Jonathan the fullest possible support in his efforts to address the problems caused by terrorism and the Boko Haram insurgency. Dr. Pogu Bitrus presented the Chibok community’s address to the President. Others who spoke at the meeting were a district head, Mr. Zannamadu Usman; a member of the Borno State House of Assembly, Aminu Foni Chibok; and some of the parents of the abducted girls. While President Jonathan had to wait for 99 days to meet with the parents still continues to baffle me.